President Donald Trump predicted Wednesday that Daesh terrorist group will have lost by next week all the territory it once controlled in Iraq and Syria. 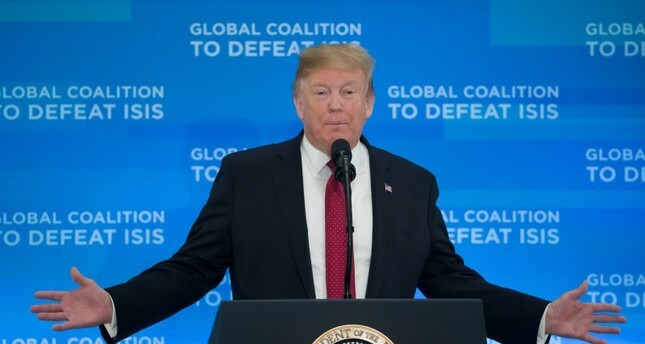 He said the U.S. will not relent in fighting remnants of the terrorist organization despite his decision to withdraw U.S. troops from Syria over the objections of some of his most senior national security advisers. The president told representatives of a 79-member, U.S.-led coalition fighting Daesh that the militants held a tiny percentage of the vast territory they claimed as their "caliphate." U.S. officials have said in recent weeks that Daesh has lost 99.5 percent of its territory and is holding on to fewer than 5 square kilometers in Syria, or less than 2 square miles, in the villages of the Middle Euphrates River Valley, where the bulk of the fighters are concentrated. Even as Trump and Secretary of State Mike Pompeo defended the withdrawal decision, which shocked U.S. allies and led to the resignations of Defense Secretary Jim Mattis and the U.S. envoy to the anti-Daesh coalition, Brett McGurk, some military leaders, renewed their concerns. While the withdrawal would fulfill a Trump goal, top military officials have pushed back for months, arguing Daesh remains a threat and could regroup. U.S. policy had been to keep troops in place until the terrorists are completely eradicated. Fears that Daesh fighters are making a strategic maneuver to lay low ahead of the U.S. pullout has fueled criticism that Trump telegraphed his military plans — the same thing he accused President Barack Obama of doing in Afghanistan. At the same hearing, Maj. Gen. James Hecker, vice director of operations for the Joint Chiefs of Staff said the withdrawal means "it is going to be difficult to keep up the pressure" on Daesh. "There will be a decrease in the amount of pressure that we will be able to apply," he said. "The concern is if we move our forces out of Syria that that may take some pressure off of Daesh forces in Syria," Hecker said. "So our mission is to try to figure out how we can continue to keep the pressure on in Syria without any boots on the ground." Pompeo called on the coalition to increase intelligence-sharing, repatriate and prosecute captured foreign fighters and accelerate stabilization efforts so Daesh remnants cannot reconstitute in Iraq, Syria or elsewhere. Pompeo mentioned the suicide bombing claimed by Daesh that killed four Americans — two service members, a Pentagon civilian and a U.S. contractor — in the northern Syrian town of Manbij last month. Manbij was liberated from Daesh control in 2016. The conference started hours after Trump, in his State of the Union address, lauded what he said was the near-complete victory over Daesh. He also reaffirmed his determination to pull out the roughly 2,000 U.S. troops from Syria. He had said in December that the pullout would proceed quickly. In liberated areas across Syria and Iraq, Daesh sleeper cells are carrying out assassinations, setting up checkpoints and distributing fliers as they lay the groundwork for an insurgency that could gain strength as U.S. forces withdraw. Activists who closely follow the conflict in Syria point to signs of a growing insurgency. Rami Abdurrahman, the head of the Britain-based Syrian Observatory for Human Rights, says Daesh still has 4,000 to 5,000 fighters, many likely hiding out in desert caves and mountains. A United Nations report circulated Wednesday said Daesh terrorists "continue to pose the main and best-resourced international terrorist threat." It said Daesh fighters remain under "intense military pressure" in their stronghold in eastern Syria, but they have "shown a determination to resist and the capability to counter-attack." A Defense Department watchdog report warned this week that even with the Daesh forces on the run, the group "is still able to coordinate offensives and counter-offensives, as well as operate as a decentralized insurgency."